Last fall, I had a really bad pain in my left side which, after a trip to the ER thinking I had a kidney stone, turned out to be a rupturing cyst on my one and only remaining ovary. A couple months later, it happened again, then again. Then, two weeks ago, as my boss and I were traveling, I started not feeling great on Monday. Tuesday evening was still not great. Mid-day on Wednesday, I realized what was happening because that familiar stabbing pain in my left side began to subtly rear its head. Of course, because this doesn’t happen all the time, I hadn’t thought to bring any pain or nausea medication to help me through. We were traveling home that day, and I’m pretty sure we walked 50 miles through airports to get to our gates. It was the worst pain I have ever been in. On the way home from the airport, Kym convinced me to go to the ER for some pain relief so I had Alan meet me there. The next morning, I had an ultrasound done on my abdomen. The tech didn’t hold a poker face for sure. She said that there was a lot of fluid that she couldn’t explain in my abdomen, and that she needed the radiologist to take a look right away and send it over to my doctor with a “STAT” status. “If they don’t call you within two hours, call them, okay?” she said. Well, that didn’t feel too reassuring. Dr. Wayman’s nurse had me come in for blood work to look at my tumor markers. At this point, I was a little worried, but it wasn’t until they handed me the radiologist report that I really began to panic. It was all I could do to hold it together in the waiting room. They took my blood and I would find out the results the next morning — the lovely waiting game that goes with cancer. But, in the meantime, I had a lot of people praying, sending positivity my way. 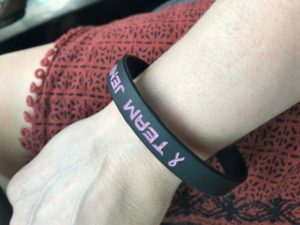 My dad was sure that because he has never taken off his two cancer bracelets (one is a Team Jenny and another is a breast cancer one he got when I was going through treatment), there was no way this would turn out to be anything. My sister and mom didn’t think it would be because their bamboo plants that we bought together in Dallas are good juju, and they are still alive. The next day, my sister broke out her bracelet. Bottom line, we had prayers, good juju and positivity covered. Alan and I went in for that appointment with Dr. Wayman. Great news! My CA125 was normal. I’m pretty sure I almost lunged forward and hugged her which might have been awkward. She said she wouldn’t be worried at all in any other circumstance, but because of my cancer history, she wanted me to see a gynecological oncologist at Stephenson Cancer Center. I haven’t been to Stephenson since my chemo and radiation treatments. The thought of having to go in there gave me a lot of anxiety which I attribute to self-diagnosed PTSD (I am a medical professional, after all). I had my appointment on Tuesday with Dr. Robert Mannel. He is the director of Stephenson and also a gynecological oncologist. After another ultrasound, Dr. Mannel basically said that this situation isn’t black and white. The fluid in my abdomen looked a lot better, but my ovary did not look normal. There was some sort of mass on it. My tumor markers are normal so that is promising, he said. (A quick Google search told me that you can have cancer and still have a normal CA125 … I quickly stopped Googling.) But, he believes there are “too many red flags to not investigate further.” He recommended doing a scope to get a close look at what is happening since imaging doesn’t show a clear enough picture. It could be something happening in my Fallopian tube that would be a quick fix. It could be scar tissue. He named a few other possibilities … and of course, it could be cancer — could be ovarian. Could be breast cancer. I immediately started running down the cancer track. Would I be considered Stage 4 if it was breast cancer? Would I have chemo? If it hasn’t spread in my abdomen, would I still have to have chemo? He answered my questions honestly and patiently, but brought me back to reality. I didn’t need to be running down that track just yet. First things first — let’s get a scope. So, Monday morning, I will be going into surgery at 7 a.m. for him to take a better look. Best possible outcome would be that he sees what is causing these issues, can fix it and leave my ovary. Taking my ovary will force me into menopause — something we have been cautioned by multiple doctors that I should try to avoid, if possible. And, all of the other possibilities, I’m trying avoid thinking about because you can’t worry until you know what you have to worry about. If he finds a mass, he will be testing it in surgery to see if it is cancer. If it is, he will take my ovary and look for anywhere else it has spread. If it isn’t, he will hopefully leave my ovary. If it does test negative, I believe they will still send it off for further pathology. That’s what happened when my lymph nodes tested negative during my mastectomy, but further pathology found some cancer cells. I’m hoping that we would get that pathology within a week or so of the procedure. The procedure should be simple. I anticipate recovery to be simple. I would appreciate any prayers, good juju and positivity as we go into tomorrow. This entry was posted in Surgery by jenny. Bookmark the permalink. All our love, prayers and positivity. Love you sweetie! Praying for good test results. You’ve been on our hearts and minds for a week now. We will be sending serious good juju the rest of this weekend into Monday morning and hoping for the most positive results possible. I pray for good test results. I’ve been thinking about you and praying non-stop. Praying for complete healing and peace I know God can deliver. Truckloads of good juju headed your way! Love you! Prayers, good juju, and positivity times five coming your way from the Arkansas Stark household. Praying so hard for you. Your team is behind you, as always. Of course we wish you luck tomorrow. We will be sitting by our phones waiting for the news. Sorry you have to deal with this roller coaster again. We love you and will be sending good thoughts your way. Darling Jenny, I am so sorry to hear you have to face this new challenge. We agree with you by faith that this is non-cancerous and that the doctor will make the right decision regarding removal of the ovary. We will be praying for the best news possible. God iy s able! Sending positive thoughts and energy as you go through this unfair journey. Breathe….for it is the most essential part of life. Thinking of you and sending love. Thinking of you and sending you lots of love, hugs and prayers! Dear Jenny, I will be praying for you and your mom and all your family. Even tho I’ve never met you I feel I know you thru your mom. You have been thru a lot but you keep fighting back as does your family. Tell your mom I love you all and am sending lots of prayers your way. You’ve got this!